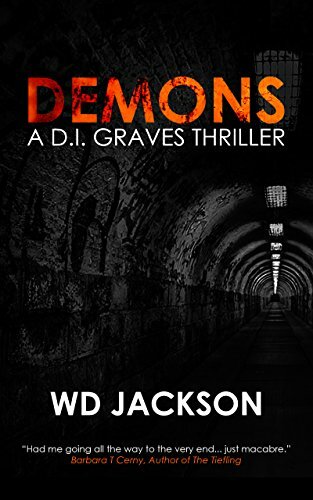 Demons takes place in London and follows DI Graves as he investigates two crimes simultaneously. The first concerns an apparent demonic haunting which results in a tragic death. At first glance the police are skeptical, but without physical evidence they have few leads to go on. The second case sees DI Graves and his team investigate killings seemingly connected to a deceased tattoo artist known anonymously as Glint. 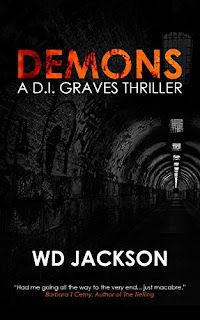 DI Graves struggles to find a motive and bring the perpetrator to justice. I thought Demons was excellent. I'm an avid reader of both crime and horror fiction so to have what, at first glance, appeared to be both included in one novel captured my attention from the outset. The unusual premise of two investigations conducted simultaneously in one book worked extremely well with both cases flawlessly executed and concluded. If I had to criticise anything at all, it would be the meek attempt to 'American-ise' the novel early on with mentions of 'sidewalks' and 'wrenches'. The book is set in London so why not stick with 'pavements' and 'spanners'? Perhaps I'm being slightly picky but it's one of my major aversions and unnecessary. Leaving that aside, the ending was brilliant; what a fantastic twist. I shall be mulling that one over for many weeks to come! My thanks to author WD Jackson for providing a copy of this book. When a bloody corpse is discovered in a North London park, Detective Inspector Daniel Graves is the man on task to the killer. With no clues and no suspects it seems like a dead end. Then another body turns up and this time it looks like it could all be his fault. Has his investigation caused the murderer to strike again? Is he dealing with a serial killer? As case one gets ever more complicated, a report comes in of another suspicious death but this is nothing like any other Graves has dealt with. All involved are convinced that something supernatural is to blame. A demon. With two cases on his shoulders and the truth seeming ever out of his grasp, Graves must race against time before both killers, human or otherwise, strike again.